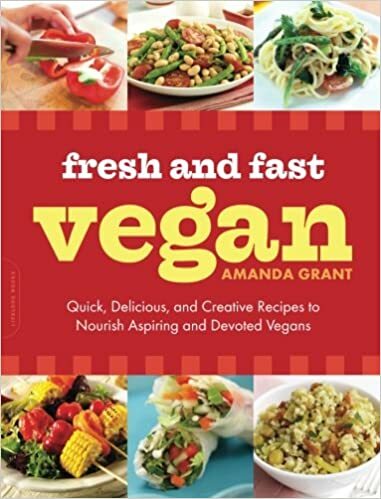 One of the original vegan cookbooks, Fresh and Fast Vegan is a must-have on any kitchen shelf. Amanda Grant has created mouthwatering dishes that not only taste great, but also help you achieve optimum health and vitality. Her winning combination of fresh and healthy ingredients—consisting of vegetables, fruits, nuts, grains, herbs, sea vegetables, and exotic spices—fantastic flavor, great variety, and quick-and-easy preparation methods make Fresh and Fast Vegan ideal for everyone interested in vegan cooking. From Thai Green Vegetable Curry to Tomato and Basil Risotto, Orange and Passion Fruit Sorbet to Chocolate Raspberry Hazelnut Cake, these delectable recipes are sure to delight even the choosiest eaters.